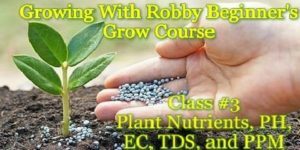 This is class #3 for the Growing With Robby Beginner’s Grow Course! This is a detailed and comprehensive class of plants nutrient needs and proper mixing and measuring of nutrients. There will be a very detailed powerpoint slide show all students will recieve a copy of after attending the class. we will be going over Micro and Macro nutrients, PH, EC, TDS, and PPM. We will also discuss how to follow feeding charts.